In a release, REDSEA Gallery announces the launch of the solo exhibit for Russian art sensation, Anna Berezovskaya, this coming May 2013. 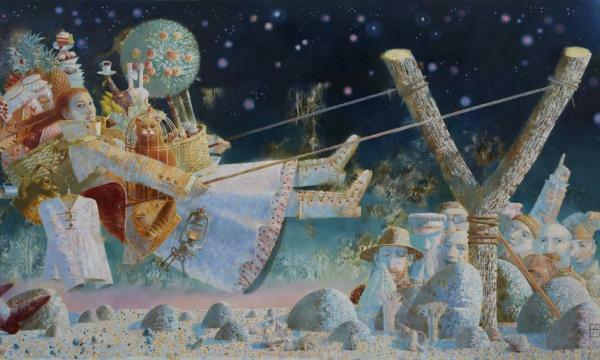 “An Enchanted Story: Volshebnaya Skazka” opens on Saturday 18th May 2013, with a two-week run, unveiling 24 of Anna’s most recent and stunning oil paintings that draw on her exceptional ability to story-tell in a unique and highly compelling artistic way. With the value of Anna’s paintings having risen 60%- 70% since her last solo exhibition with REDSEA Gallery, and at just 26 years old, Anna is now established as one of the most inspiring contemporary young artists to come out of Russia in recent times. This exhibition will showcase a sensational new range of work including the amazing ‘Wade’ at 200cm x 80cm (pictured above) and ‘Seafarers’ (100cm x 140cm) a captivating tale in which Anna depicts a battalion clashing in a battle for the heart of the young lady at the centre of the piece.